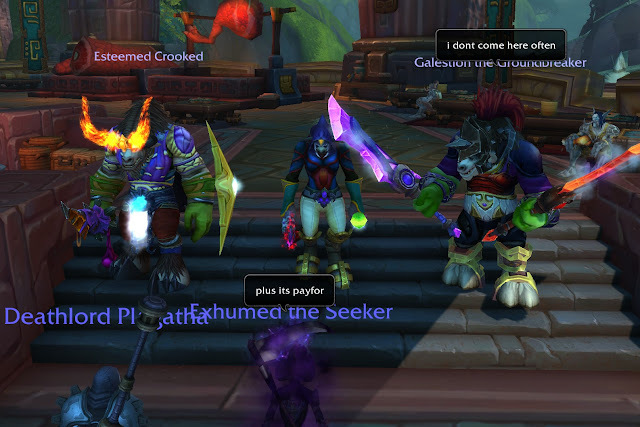 We did try to do a couple of games together but they didn't go well and I thought he'd do better pugging. Sometimes you get into really good melee comps. 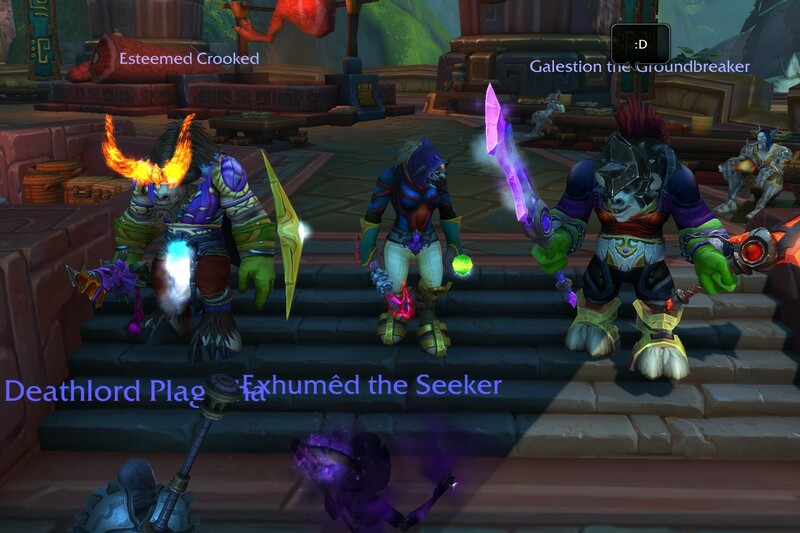 But pugging arenas can be hard and frustrating. People yell at me a lot if I play not to their style, sometimes you just can't win anything, but sometimes you get lucky and make new friends. Anyway, last Thursday Crooked asked me to do some arenas. Season is ending in a few days, and he needed like 13% or something. Galestion needed a little bit too, but he was pugging arenas and doing ok. 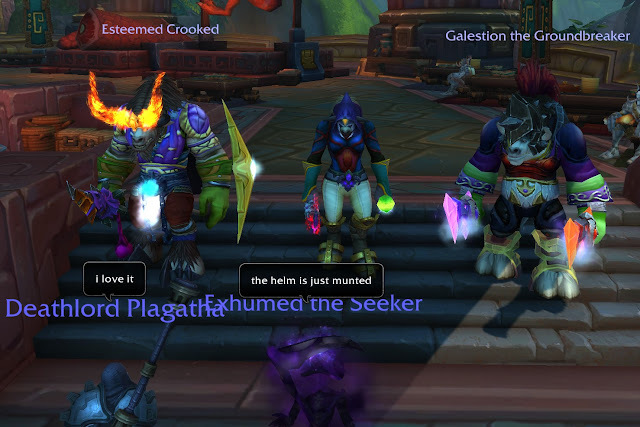 So we tried a few games, with Crooked DPSing and me healing and we lost all of them. Then we tried some more with me DPSing, and we lost a few more. I was feeling a bad. I was dragging down their rating and if we got too low then even wins wouldn't even count! 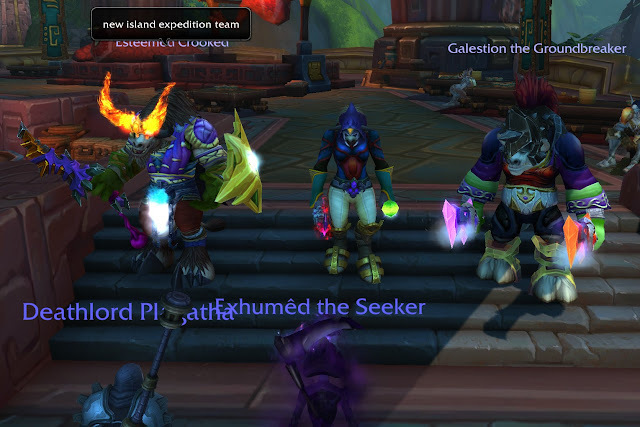 "Maybe we'd do better if HK was here," Galestion said to me. Wow, that hurt. 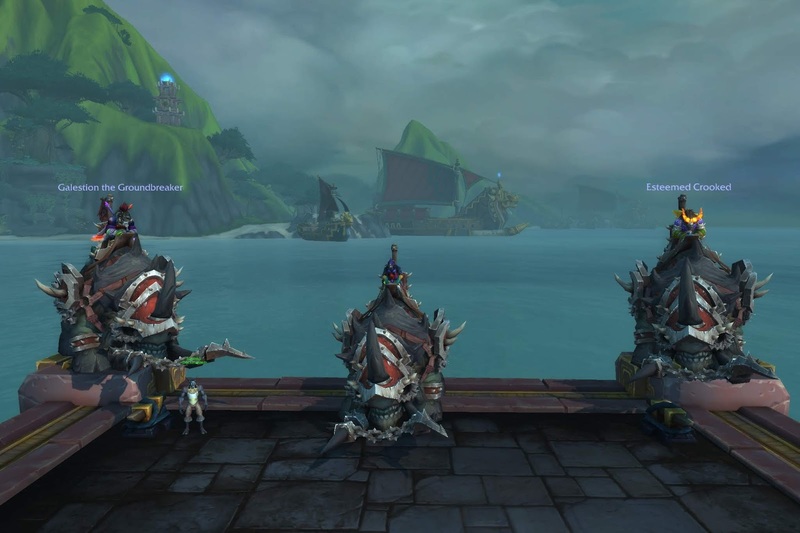 HK doesn't even PvP. He hates arena. Now I REALLY FELT BAD. Then we finally got a break - perhaps because my rating dropped so we went into a different bracket, and we won one. Yay! That one win spurred us on and then we ended up playing 26 or 28 games and they got their last 13%. 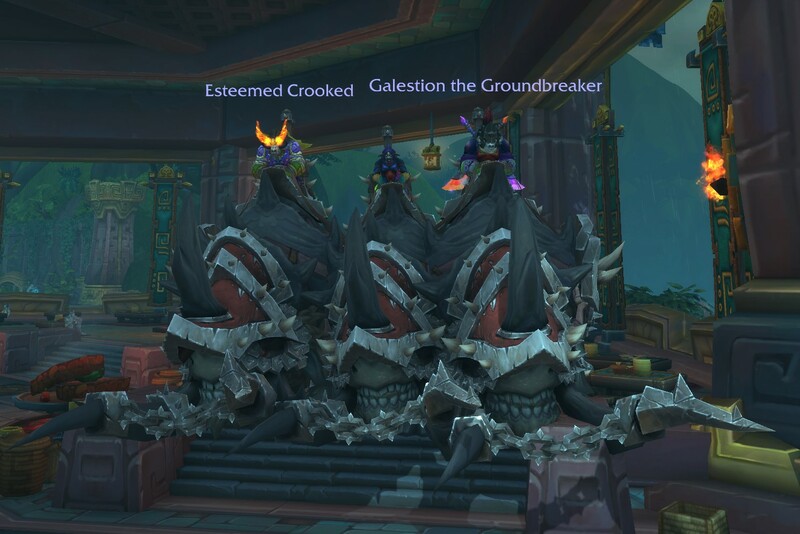 Galestion was 3% ahead of Crooked so he got his first and then Crooked got his and I think I was happier than either of them that we finished their arenas. Yay! OMG I actually DPS'd some arena! To celebrate, I said we had to take a picture. I put on my Galestion mog and told Crooked he had to make one too. 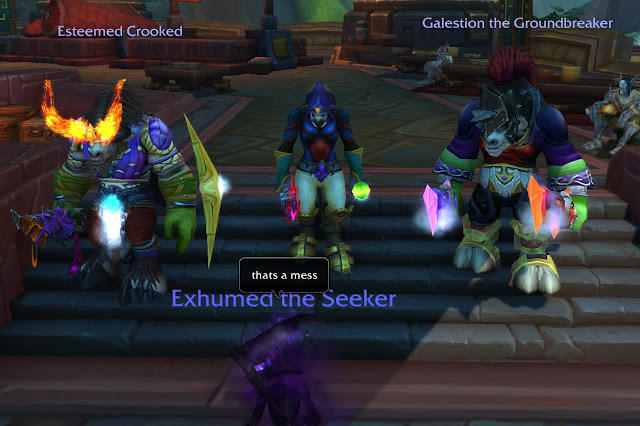 Whilst we were standing around in Dazar'alor playing with transmogs, a priest came up, looking at us. "Damn that's bis" he said. 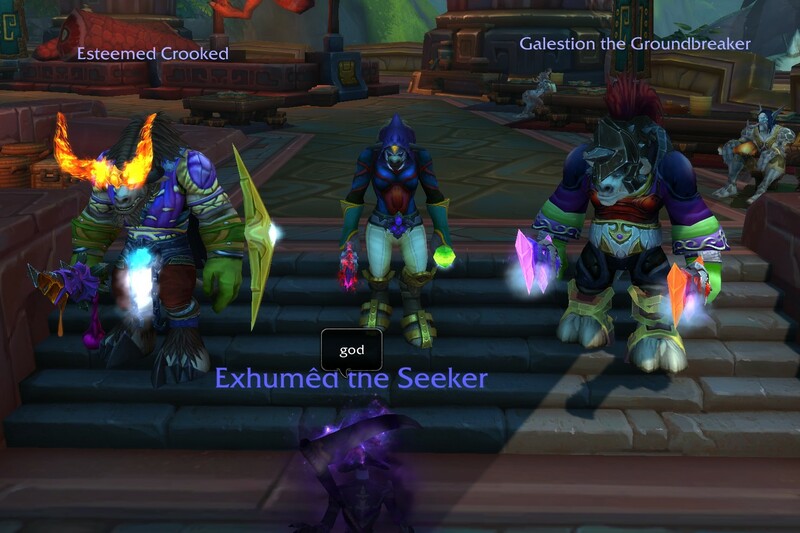 "Nothing to see here," said Galestion. But the guy emoted greeting to Gale, so Gale and I cheered at him. "Fashion police are here," Gale said. "Look busy." 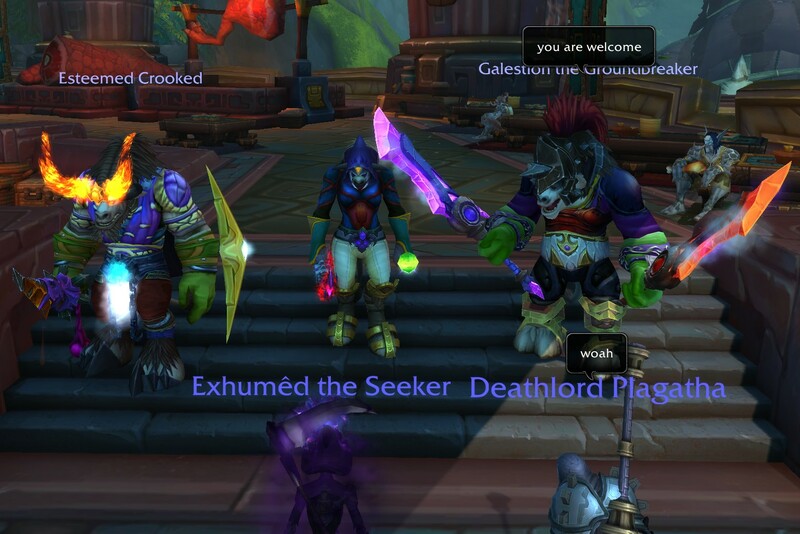 The priest said, "Is it like a bad mog contest?" "Because," said the priest, "If I'm choosing out of you guys, uhhh...."
"Wait for the shaman to finish," I said. "Yeah," said the priest. "The helm on Gal. Makes him look like a retarded mentally challenged power ranger." So Crooked finished his Galestion mog and we stood up for judging. The conversation was quite funny! Amusingly, someone else came along to "admire" our outfits! That was a barrel of laughs. The DK then said "Judge me! Judge me!" and ran off to transmog and then came back. "This is pretty terrifying," she said. "Judge me." 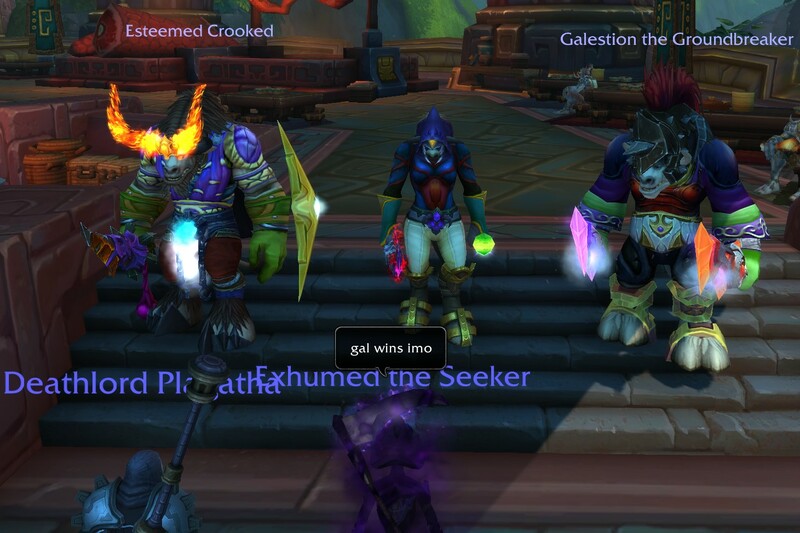 "I would tap that," said Galestion. "I think you could have a better hat," I said. "The rest is fab ugly!" She changed it to the red and yellow. "Ohhh, that's much better!" I said. "Hideous!" "Thank you, thank you!" she said. "Keep it up," said Gale. She wanted to be in our pic. So here we are. Now, to take pics on our Vicious War Clefthoofs! Or is that Clefthooves? 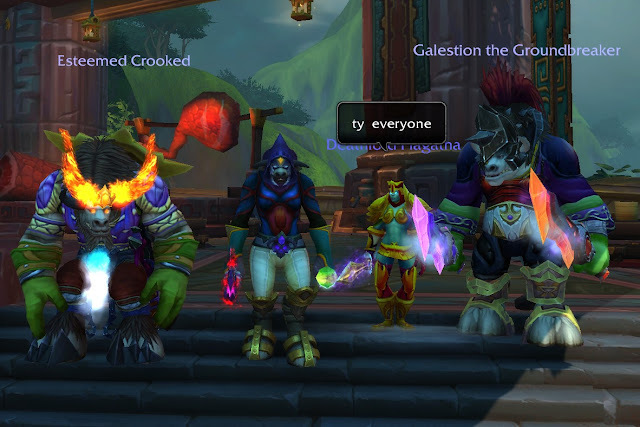 Grats guys! Hey, so do you think we can do it again next season? 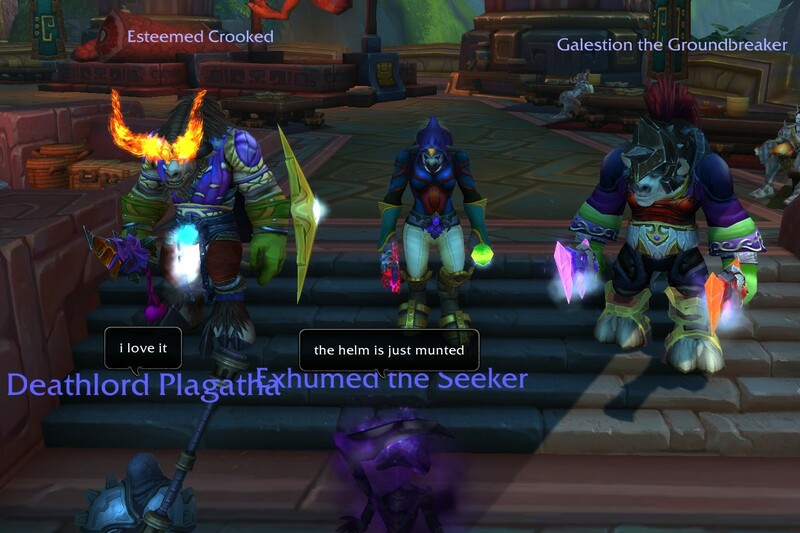 :D TEAM TAUREN!